Allen (knee) finished the 2018 regular season with 97 catches for 1,196 yards and six touchdowns on 136 targets in 16 games, adding six catches for 112 yards and another score in two playoff appearances. Allen exited the Pro Bowl on Sunday after sustaining a knee bruise, Brooke Pryor of The Kansas City Star reports. Analysis: Allen had a busy afternoon prior to his exit, catching four of six targets for 95 yards, including a 50-yard reception in the first quarter. The injury doesn't appear too concerning, but it would nonetheless be surprising to see the 26-year-old return to the field Sunday. Allen caught two of six targets for 75 yards and a touchdown while also catching a two-point conversion in Sunday's 41-28 divisional-round loss to New England. 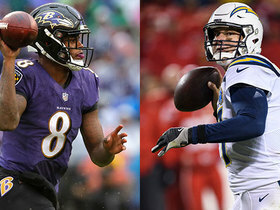 Allen brought in four of six targets for 37 yards in the Chargers' 23-17 wild-card win over the Ravens on Sunday. Analysis: Allen was largely kept in check by the stingy Ravens defense throughout the afternoon, and he essentially did his damage relatively close to the line of scrimmage. As his regular-season numbers (97-1,196-6) corroborate, the veteran pass catcher remains Philip Rivers' most trusted target. Consequently, he's likely to see a larger workload during what shapes up as a slightly less intimidating matchup in next Sunday's divisional-round clash with the Patriots. 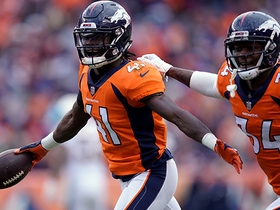 Allen caught four of seven targets for 64 yards in Sunday's 23-9 win over the Broncos. Analysis: Allen split targets, catches and yards evenly with Mike Williams, but Williams came down with the lone touchdown reception in the game. Allen has had an uneven season in that respect, with just one score through the first nine weeks followed by a touchdown in five straight, only to finish the regular season without finding the end zone again. The 26-year-old will now face the Ravens, who held him to five catches for 58 yards in Week 16, on the road in the first round of the playoffs. Allen snagged five of his eight targets for 58 yards in the 22-10 loss Saturday to the Ravens. Allen (hip) is active for Saturday's contest against the Ravens. Analysis: All indications throughout the week suggested Allen would be good to go for the pivotal contest against the Ravens, and that proved correct following the release of the Chargers' inactive list. Baltimore has allowed the third-fewest fantasy points to the wide receiver position this season, but Allen has proven to be essentially matchup proof in 2018 and should be set to receive his usual 10-12 targets once more. Allen (hip), who is listed as questionable for Saturday's game against the Ravens, is on track to play in the contest, Steve Wyche of NFL Network reports. Analysis: Echoing the notion put forth Thursday by Adam Schefter of ESPN, Wyche relays that he has "been given every indication that (Allen) will be playing." The Chargers' top receiver is thus trending toward an active status, but those considering Allen in weekly lineups are still advised to verify his availability when the team releases its inactive list 90 minutes prior to the 8:20 p.m. EST kickoff. Allen (hip) is listed as questionable for Saturday night's game against the Ravens. Analysis: That said, Adam Schefter of ESPN indicates that Allen -- who suffered a hip pointer in Week 15 -- is expected to play this weekend, a notion that will be confirmed, either way, upon the release of the Chargers' inactives in advance of Saturday's 8:20 ET kickoff. Assuming he suits up and avoids any in-game setbacks, Allen should return to his usual high-volume role in the Chargers offense. Allen (hip) is expected to play Saturday night against Baltimore, Adam Schefter of ESPN reports. Allen (hip) logged a limited practice Wednesday. Analysis: Allen, who was listed as a non-participant Tuesday, is thus trending in the right direction as Saturday's game against the Ravens approaches. It won't be known until Thursday, however, if Allen will be listed as questionable for that contest or head into the weekend free of an injury designation. 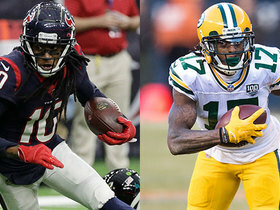 Allen (hip) took part in practice Wednesday, Eric D. Williams of ESPN.com reports. Analysis: It's likely that Allen will be listed as a limited participant in the Chargers' second session of the week, but his ability to practice in any capacity is encouraging with regard to his chances of playing Saturday against the Ravens. Coach Anthony Lynn said Allen (hip) may be a game-time decision Saturday against the Ravens, Jeff Zrebiec of The Athletic reports. Analysis: Allen left the Chargers' huge Week 15 win at Kansas City with a hip pointer that is threatening to lead to his first absence since missing all but one game in 2016 due to a torn ACL. He didn't put the best foot forward Tuesday with no activity at practice, per Eric D. Williams of ESPN.com. Nevertheless, two opportunities remain for him to upgrade to a limited or full participant this week. Allen (hip) is not participating in practice Tuesday, Eric D. Williams of ESPN.com reports. Analysis: Allen is considered a candidate to take the field versus the Ravens on Saturday despite being limited to just 17 offensive snaps in Week 15 due to a hip injury. His omission from practice Tuesday's isn't a good sign, but there's still some time for him to get work in to suit up. If he ultimately can't, Tyrell Williams, Mike Williams and Travis Benjamin would presumably draw more targets again. Allen (hip) has a chance to return for Saturday's game against the Ravens, Adam Schefter of ESPN reports. Analysis: Allen suffered a hip pointer during the second quarter of Thursday's 29-28 win in Kansas City, sitting out the rest of the contest but sticking around on the sideline to watch. With extra time to recover and no indication his injury is severe, the 26-year-old wide receiver has a shot to avoid any further missed time. 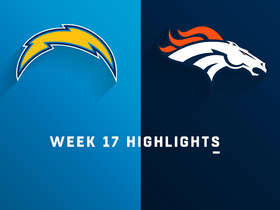 The Chargers will release their first Week 16 practice report Tuesday afternoon. Allen suffered a hip pointer during Thursday's win over the Chiefs, Ian Rapoport of NFL Network reports. Analysis: Per the report, Allen's hip issue doesn't entail any structural damage and is not viewed as a long-term issue. His status for the team's Dec. 22 game against the Ravens will need to be monitored, but the Chargers' current short week gives their top wideout some extra healing time in advance of Week 16 preparations. Coach Anthony Lynn didn't offer any update on Allen's hip injury Friday morning, Eric D. Williams of ESPN.com reports. Allen is questionable to return to Thursday's game against the Chiefs with a hip injury. Analysis: Allen has been on a tear recently, scoring in five straight outings, but has been shut out so far in Kansas City. He appeared to injure himself while making an attempt at a catch in the second quarter. Mike and Tyrell Williams will likely gain a larger share of the passing game if Allen is forced out for the remainder of the contest. Allen snagged five of his nine targets for 78 yards and a touchdown in the 26-21 victory over the Bengals on Sunday. Analysis: Allen's touchdown kicked off the scoring Sunday, breaking free for a nifty red-zone reception. Concerns regarding Allen's prowess near the goal line appear to be fading by the week as the 26-year-old has caught a touchdown in each of the last five games. Easily the Chargers' No. 1 wide receiver, Allen should be poised for another solid matchup against the Chiefs, whom he torched for eight catches, 108 yards and a touchdown back in Week 1. Allen corralled 14 of 19 targets for 148 yards and a touchdown in Sunday's 33-30 win over the Steelers. He also scored on a two-point conversion. Allen caught all seven of his targets for 72 yards and a touchdown in the 45-10 win Sunday over the Cardinals. Analysis: Allen had a number of astounding catches in this contest, including a 20-yard tip-toeing reception which set up a touchdown to end the second quarter, and then a similarly difficult catch near the back end zone to begin the second half, which put the contest out of reach. Allen has only topped 100 receiving yards twice this season, but three straight weeks with a touchdown has turned the tables on what could have been a disappointing fantasy season for the Chargers' top receiver. Allen caught nine of 12 targets for 89 yards and a touchdown during Sunday's 23-22 loss to the Broncos. He also carried one time for one yard. Analysis: Allen led the team in targets, catches and yards while posting his fourth-highest output of the season in that regard. He caught a four-yard touchdown pass in the second quarter, giving him two scores in as many weeks after a seven-game drought. Allen has 21 catches in three games since the bye and is averaging 90 receiving yards per contest over that stretch, in addition to his two TDs. He'll look to keep it up in next Sunday's matchup with the Cardinals. Allen (hip/finger) doesn't carry an injury designation into Sunday's game against the Broncos, Adam Caplan of SiriusXM Radio reports. Allen (hip/finger) was added to the Chargers' Week 11 injury report after logging a limited practice Thursday. Analysis: So far there's nothing to suggest that Allen's availability for Sunday's 4:05 ET kickoff against the Broncos is in danger, but given that he's a mid-week addition to the injury report, the wideout's situation should be monitored. We'll revisit Allen's status Friday to see if he draws an official injury designation or ends up being removed from the Chargers' final injury report of the week altogether. Allen caught six of nine targets for 57 yards and a touchdown in Sunday's 20-6 win over the Raiders. Analysis: Allen caught an 11-yard pass in the front corner of the end zone to give the Chargers the lead for good just before halftime. While the 26-year-old has been a bit touchdown-starved this season, he remains one of the NFL's elite route runners and the centerpiece of the Chargers' passing game. He'll hope the positive regression continues at home Week 11 against Denver. Allen caught six of his 10 targets for a season-high 124 yards in Sunday's 25-17 win over the Seahawks. He also carried the ball twice for 28 yards. Allen hauled in all five of his targets, amassing 72 receiving yards during Sunday's 20-19 win against Tennessee. Allen caught four of six targets for 62 yards and added 41 yards on four rushing attempts in Sunday's 38-14 win over Cleveland. 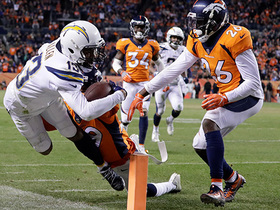 Analysis: Melvin Gordon (three rushing touchdowns) and Tyrell Williams (two receiving touchdowns) did most of the damage for the Chargers, though Allen chipped in with over 100 yards from scrimmage. He's topped 60 receiving yards in five of six games ahead of a Week 7 clash with the Titans. Allen caught eight of his nine targets for 90 yards in Sunday's 26-10 win over the Raiders. Analysis: Allen failed to catch a touchdown for the fourth consecutive game, but his 34 percent target share was easily the highest on the team. Especially in PPR formats, Allen remains one of the most consistent wideout options available, but with the likes of Antonio Gates, Mike Williams, Melvin Gordon and Austin Ekeler dominating the red-zone looks, it's difficult to project Allen receiving anything more than a cursory look near the goal line. Allen caught seven of his 10 targets for 63 yards in Sunday's 29-27 win over San Francisco. Analysis: Allen shared the team lead in catches and targets with Melvin Gordon but paced the team in receiving yards on the day. The 26-year-old has not seen fewer than seven targets in a game on the year, but has only one 100-yard effort and one touchdown to show for it so far, both Week 1 against Kansas City. He'll look to bust out in another home game Week 5 against Oakland. Allen (knee/tooth) is listed as active for Sunday's game against the 49ers. 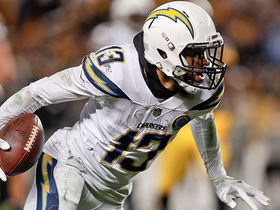 Analysis: The Chargers' top pass-catcher is thus good to go Sunday and should see his share of targets in the team's Week 4 attack. Through three games to date, Allen has parlayed his 17 catches (on 26 targets) for 219 yards and a TD. Allen (knee/tooth), who is listed as questionable for Sunday's game against the 49ers, is expected to play, Adam Schefter of ESPN reports. Analysis: Schefter's report essentially matches what coach Anthony Lynn said about Allen's status for Week 4 when the wideout was able to return to practice Friday in a limited capacity after missing the first two sessions of the week. The knee issue is presumably the greater concern at this juncture for Allen, who was sidelined for 15 games in 2016 due to a torn ACL. Allen (knee/tooth) is listed as questionable for Sunday's game against the 49ers. Analysis: Allen's status is worth tracking all the way up to the release of the Chargers' Week 4 inactives prior to the team's 4:25 PM ET kickoff Sunday, but coach Anthony Lynn noted Friday that he believes Allen will be fine this weekend. The wideout practiced in a limited fashion Friday. Allen (knee/tooth) returned to practice Friday, Eric D. Williams of ESPN.com reports. Analysis: While his level of participation and Week 4 injury designation have yet to be revealed, Allen's return to practice -- in any capacity Friday -- bodes well for his chances of suiting up Sunday against the 49ers. Allen (knee/tooth) did not practice Thursday. Analysis: Wednesday's injury report cited Allen's knee issue as the culprit for his absence from practice. Subsequently, Thursday's report noted a tooth issue as well. In any case, what the team's top pass catcher is able to do Friday will be telling with regard to his status for Sunday's game against the 49ers. With Travis Benjamin still limited by a foot injury, Tyrell Williams and Mike Williams currently profile as the Chargers' healthiest wide receivers. Allen was listed as a non-participant at Wednesday's practice due to a knee injury. Analysis: Allen wasn't spotted on the field ahead of practice, so the injury offers an explanation for why he was absent. He was subbed out at a few different points during the second half of Sunday's 35-23 loss to the Rams, ultimately handling his lowest snap share (77 percent) of the young season. With nothing to suggest the injury is severe, Allen could put himself on track for the Week 4 game against the 49ers with a return to practice in any capacity Thursday. Allen sat out practice Wednesday. Analysis: It remains to be seen if Allen's absence was caused by an injury or simply a case where the Chargers handed the veteran a maintenance day. So far there's been nothing to suggest that Allen's Week 4 status is in any danger, but an update will be provided if that changes. Allen isn't participating in the portion of Wednesday's practice open to the media, Eric D. Williams of ESPN.com reports. Analysis: The Chargers never actually reported an injury, but Allen did appear to be limping at one point in Sunday's 35-23 loss to the Rams, ultimately playing just 77 percent of the offensive snaps after logging a 88 and 89 percent share during the first two weeks of the season. Another update will be available when the Chargers release their first injury report of the week. Allen caught three of his seven targets for 44 yards in Sunday's 35-23 loss to the Rams. Allen hauled in six of eight passes for 67 yards during Sunday's 31-20 win in Buffalo. Analysis: There were fewer passes to go around this week as opposed to the season opener with the Chargers firmly in the lead from the outset and opting to drain the clock, but Allen picked up a larger target share (29.6 versus 21.6 percent). The former is actually closer to his number from 2017 (27.3 percent), so it's difficult to argue with Sunday's result. Allen will now focus on preparation for a Week 3 matchup with the crosstown-rival Rams. Allen caught eight of 11 targets for 108 yards and a touchdown in Sunday's 38-28 loss to the Chiefs. Analysis: Allen was quiet in the first half, as Kansas City limited San Diego's offense to underneath passes to running backs and tight ends. The Chargers opened things up in the second half, while playing from behind, and Allen was one of the primary beneficiaries. He should continue to see a ton of looks in what should be a strong offense. Allen secured his only target for five yards during Saturday's preseason game against the Saints. Analysis: Chargers coaches got the starting offense out of the game before the second quarter ended, though Allen isn't the kind of guy who needs a whole lot of preseason work in order to get ready for the regular season. Look for the receiver to be much, much more involved when the games start to matter. Allen (rest) won't play in Saturday's preseason opener against the Cardinals, Kent Somers of The Arizona Republic reports. 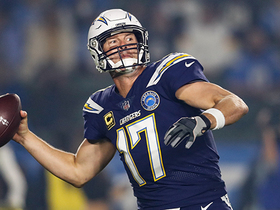 Analysis: Starting quarterback Philip Rivers has also been given the day off as the Chargers attempt to keep their stars healthy in advance of the regular season. In Allen's absence, Tyrell Williams, Mike Williams and Travis Benjamin should serve as the first-string receivers Saturday. Allen could spend more time playing the slot in three-wide formations with TE Hunter Henry (knee) out for the season, ESPN.com's Eric D. Williams reports. Allen caught nine of his 12 targets for 133 yards and a touchdown in the 30-10 win over the Raiders on Sunday. He also recovered a fumble for a touchdown early in the contest. Analysis: Finally healthy after two seasons ruined by serious injuries, Allen capitalized on his immense potential by recording 102 receptions and 1,393 receiving yards, easily career-highs for the 25-year-old. So long as veteran quarterback Philip Rivers returns for his 15th season in the NFL, Allen projects as a potential early-round selection in redraft leagues come the fall, particularly in points-per-reception leagues given the 25-year-old's immense usage rate (159 targets in 2017). Allen finished with five catches for 63 yards on 10 targets in Sunday's 14-7 win over the Jets. Analysis: Allen turned in a pedestrian performance offensively, with the highlight of his day actually coming on a defensive play as he intercepted Jets quarterback Bryce Petty on a Hail Mary to end the first half. After four consecutive performances over 100 receiving yards, Allen has cooled off with a combined 117 yards in his past two appearances. Los Angeles is in the thick of the AFC playoff race at 8-7, so expect a full workload for the team's top wide receiver against Oakland next week. Allen (back) is not listed on the Wednesday injury report. Analysis: Allen was carted off the field in the second half of Saturday's 30-13 loss to the Chiefs, but he apparently is back at full strength ahead of Sunday's game against the Jets. He'll look to get back on the right side of the century mark, after losing a four-game streak with at least six catches and 105 yards. 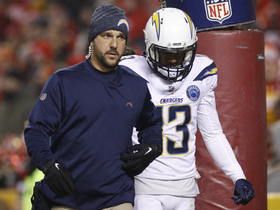 Chargers head coach Anthony Lynn said Monday that he expects Allen (back) to be fine. Allen was carted off the field late in Saturday's game due to a back injury, Eric D. Williams of ESPN reports. Analysis: Allen was sitting up and seemed in decent spirits as he was getting carted off, but we'll see if this carries into next week, which will be a crucial one with the Chargers' season now on the line after a tough loss to the Chiefs. Allen caught five of eight targets for 54 yards during Saturday's 30-13 loss to the Chiefs. Analysis: Allen led the team in targets, but a concerted effort to contain him by the Kansas City defense caused his streak of four straight games over 100 receiving yards to come to an abrupt end. This wasn't exactly what Allen's fantasy owners envisioned, considering his recent success and the matchup against one of the most generous pass defenses in the league. Despite this disappointing effort, Allen remains a top-tier fantasy asset and will look to bounce back next week against the Jets. Allen brought in six passes (on eight targets) for 111 yards in Sunday's win over the Redskins. Allen caught 10 of his 14 targets for 105 yards and a touchdown in Sunday's 19-10 win over the Browns. Allen caught 11 of his 14 targets for a career-high 172 receiving yards and a touchdown in Thursday's 28-6 win over the Cowboys. Allen caught 12 passes on 13 targets for 159 yards and two touchdowns during Sunday's 54-24 victory over the Bills. Allen caught four of his seven targets for 48 yards in Sunday's 20-17 overtime loss to the Jaguars. He also carried the ball once for six yards. Analysis: Allen has now seen seven or fewer targets in each of the last three games, in large part because the Chargers have opted to throw to their running backs significantly more out of the backfield. Given Allen has seen just two red-zone targets in the last three weeks, he's simply a consistent, albeit underwhelming, PPR option most weeks. 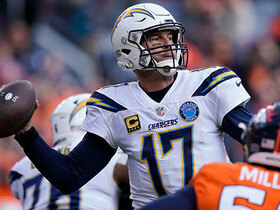 Los Angeles Chargers quarterback Philip Rivers finds his wide receiver Keenan Allen for a first down and gain of 17 yards. Los Angeles Chargers quarterback Philip Rivers slings a pass to his wide receiver Keenan Allen across the middle for a first down. 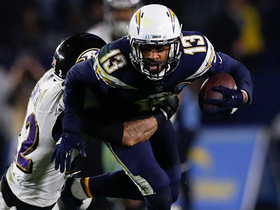 NFL Network's Ian Rapoport reports there's a 'good chance' Los Angeles Chargers wide receiver Keenan Allen plays against the Baltimore Ravens on Saturday for Week 16. NFL Network's "NFL Fantasy Live" crew projects how marquee players from the Baltimore Ravens and Los Angeles Chargers will perform in Week 16. 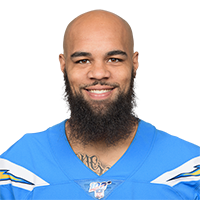 Los Angeles Chargers wide receiver Keenan Allen leaves the game after an injury.